Parenting is exhausting, what with all those night feeds and early wake up calls it's so easy to get worn out and feel exhausted 24/7. 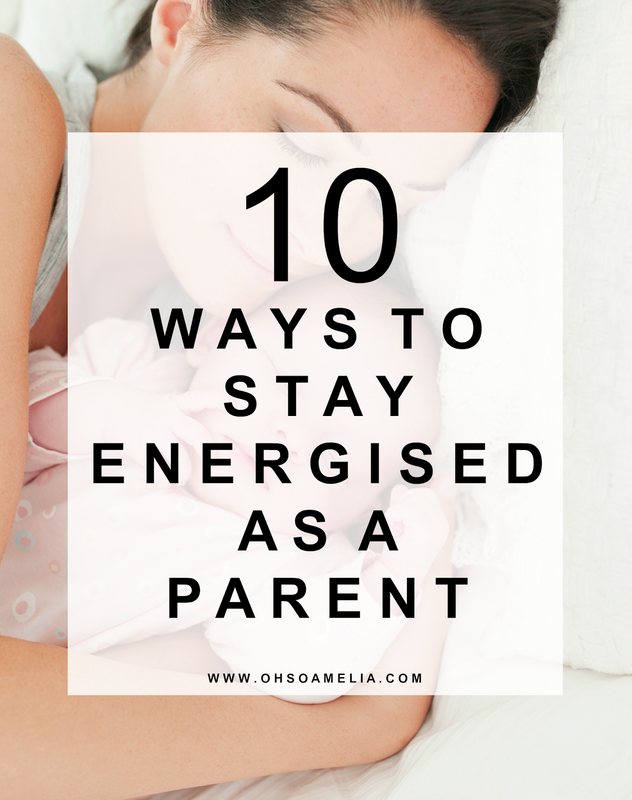 With this in mind, here are 10 ways to stay energised as a parent. Make a habit of eating breakfast every day before you start your day. A healthy breakfast will give yo the energy and satisfaction you need to see you through to lunch. Porridge is a great way to start your morning topped with seeds, nuts or fruit. Don't have time to make porridge in the morning, how about preparing some overnight oats once the kids are in bed and popping them in the fridge ready for you to eat in the morning. Boiled eggs and avocado on toast are also a great breakfast to give you that get up and go feeling! Not a breakfast person, how about a healthy smoothie instead? You can add in as many ingredients as you like including fruit, vegetables and seeds which can be hidden. If you're lacking in energy try upping your intake of vitamin B by taking Multivitality Boost. Multivitamins are a great way of getting a balanced amount of the right vitamins and minerals and Multivitality Boost is a revitalising multivitamin drink to help recharge your batteries, and to help overcome tiredness and fatigue. There are various other vitamins you can take to boost your energy as well as vitamins for your children or whether you're pregnant. Dehydration can affect your mood before you even feel thirsty. Long term dehydration can leave you with headaches and feeling fatigue so ensure that you are getting at least 8 glasses of water a day to keep hydrated. If you find it hard to drink enough water throughout the day perhaps a water bottle will help. We all know that the first few years of parenthood mostly consist of sleepless nights due to teething and numerous night feeds, however instead of staying up watching game of thrones or catching up on soaps you've missed when your newborn was screaming down the house a few hours earlier, have an early night! It will do you the world of good and you won't feel as sluggish when you wake up the next morning having 6-8 hours of interrupted sleep than 4 hours! By switching off your laptop and phone a couple of hours before you go to bed you'll find that you wake up more energised and refreshed. I now make it a goal of mine to turn the laptop off an hour before I go to sleep and have noticed a difference! You're definitely not a bad parent if you park your kids in front of the TV or give them their iPads for 30 minutes or pop the baby in the playpen. Part of being a good parent means taking good care of yourself as well. This means that sometimes it's necessary to have a few minutes to yourself even if it's just to enjoy a cup of tea and magazine by yourself for five minutes! There are various foods you can eat which will give you that boost of energy you need. Oats, lentils, brown rice, spinach, sesame seeds, apricots, almonds are all energising foods which you can either snack on during the day or incorporate into meal time dishes. It's important that you get enough omega 3 in your diet. It can help reduce inflammation in your body which in turn can have a huge effect on the way you feel. A good option is to incorporate fish into your diet, however if you don't like fish and are put off by the taste then try Super Strength Omega 3 (£11.95 for 60 capsules). I find myself most productive work wise in the mornings so I schedule any errands and housework later in the afternoon so I can get more work done in the morning. Although they may differ for everyone it is a good idea to schedule around your energy peaks to be more productive and stay organised. You may not feel like it, but taking a 10 minute brisk walk will make you feel more energetic than eating a snack bar. Simply getting more oxygen pumping around your body helps you feel more alert. Take the dog for a walk or put your baby in the pram and go for a stroll. If you can't get outdoors for whatever reason then open a window and let in some fresh air. By opening a window you're reducing the carbon dioxide which links to afternoon fatigue. What are you tips and suggestions for staying energised as a parent? * In collaboration with Healthspan. For details on how I work with brands take a look at my work with me page. I note that you are now a single parent. I'm an aunt but after one day with my sisters kids...I'm glad to hand them back. Complete respect for all mums/dads who do this day in and day out!! Thank you for the tip about needing Omega 3. I don't like seafood; however, I will try the supplements! These are amazing tips! I could definitely stand to take some vitamins and get a little more sleep! And I love the idea of getting out for some fresh air! Great tips - we need all the help we can get sometimes!! These are great tips! The hydration part is hard for me, I just don't remember to keep drinking water all day. Thanks for the reminder! Great tips! I definitely need to take more vitamins. These are great tips! It is so easy to feel overwhelmed and exhausted as a parent. Pinned this! I have been having SUCH a hard time with staying energized lately! So these are great tips :) My hubby has been encouraging me to get out and exercise a bit, and it's really been helping. I am not great at breakfast, but lately I've been pretty consistent with cereal and milk. I've heard about overnight oats, and really want to try them!